VA GOP Attacks Ralph Northam for Rejecting…Slavery and White Supremacy? HUH??? Unfortunately for the preservation of Virginia's African American history, Richmond's Mayor, a man of color and the book, is either morally corrupt or benignly ignorant. Doesn't matter which, the result may be the same. It is not surprising that a typical American does not value the history of a place. But failure to grasp his own heritage is a mortal flaw. There are a few stories here. The ground under Shockoe Bottom is one. 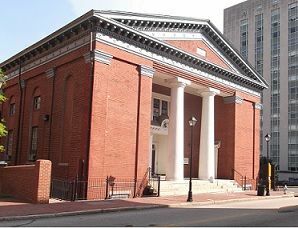 The legacy of what went on there and in Jackson Ward and throughout Richmond is another. That legacy screams for every effort to remedy the high unemployment among blacks in Richmond and the accompanying fratricide. A properly funded and directed school system and full-time employment opportunities should be job one. Instead, places for games that feather already well-healed nests and half million dollar studies of half-cocked ideas consume Richmond City revenues. Great photo ops, though. Compound this with the arrogant, aloof stance that Richmond is immune from federal Section 106 regulations which is even more insulting than any tea party nullification rant. If Jones were Mayor of Jerusalem, he'd solve that whole Temple Mount thing by razing both al Aqsa Mosque and the Dome of the Rock then build condos and concessions surrounding a miniaturized, motorized laser show of popular myths: Abraham and alternating sons; Moses (I know, I know, but authenticity is not important) delivering an Ark of the Covenant emanating lightning bolts; Jesus in a fit turning over tables; Mohammad gliding in on his horse; you get it, something for everyone. Maybe the race to succeed Virginia state Senator Henry Marsh (D-16th) whose former district includes much of Richmond's East End will provide a vehicle for Delegates McQuinn (D-70th), whose current district encompasses less and Dance (D-63rd) whose current district covers none to help crystalize the debate. McQuinn seems to be able to straddle both sides of the issue, which hasn't been helpful and could make it quite a tango for Dance. Both probably believe Jones' endorsement would be to their advantage in the contest. In reality, electoral influence is likely the only reason any politician patronizes Jones. Developers seem to believe there are other purposes. 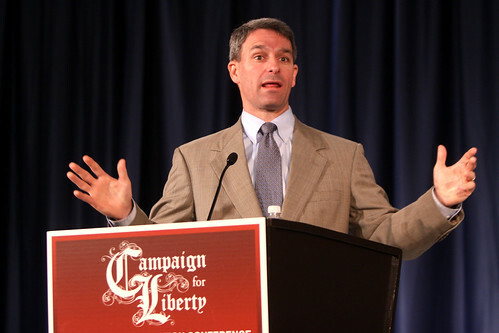 The outspoken conservative and candidate for governor made an almost identical statement in a 2008 "Cuccinelli Compass," a regular letter he writes to supports to supporters, The Washington Examiner has learned. In it, Cuccinelli reviews a biography on British abolitionist William Wilberforce and draws a connection between Wilberforce's fight against slavery to his own efforts in the Virginia Senate to curb abortions in the state. Two recent articles show the lengths that Republicans will go to appropriate the time of the unemployed and the jailed for free labor. First, the Senate Republicans now want to punish the unemployed even more. Not only do they want to impose a drug-test tax, and deny benefits to those without a high school education, they also want the unemployed to work for free (i.e., de facto slavery). Given that the economy has downsized more people of color, with African American unemployment running as high as 50% in some places, this move has rather sinister and historic non-subtle overtones. It should be a federal crime to demand anyone work for free. But here we are with the Senate GOP demanding exactly that. Sen. Richard Burr wants to make those on unemployment prove they have applied for a job at least 20 hours a week AND work for free another 20 hours a week, just to get the paltry insurance they are owed. Unemployment insurance is paid by companies to cover employees when the same companies lay off workers. It is the last disincentive to firing and downsizing, and as we have seen, not nearly enough so. When it is a choice of further enriching the already rich or paying workers, you know what the corporate CEOs decide. With at least 2/3 of the unemployed unable to find work, that is a large number of conscripts into servitude. Why, maybe the very same employers who eliminate their jobs can gain their free labor (sarcasm)?